In Italy, grilled steak is epitomized by bistecca alla fiorentina. 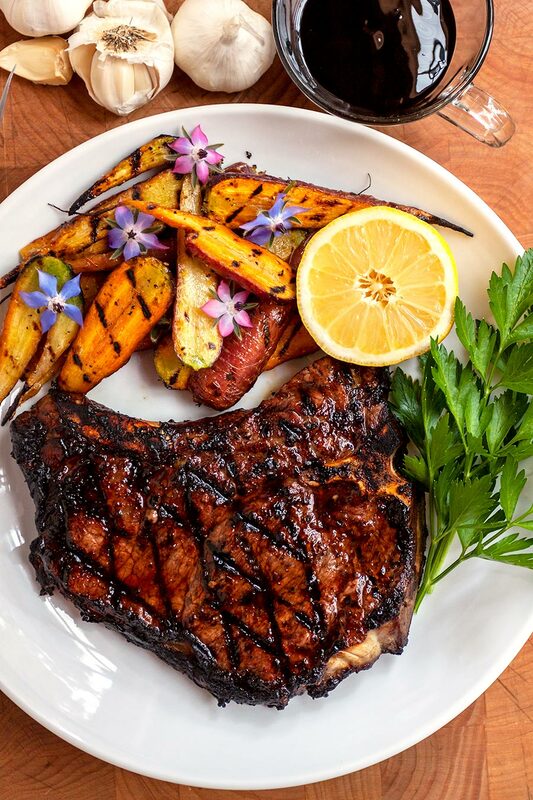 Try our twist on the classic recipe for an easy barbecue, featuring succulent steaks simply served with lemon, Italian-style. It all starts with a great steak. 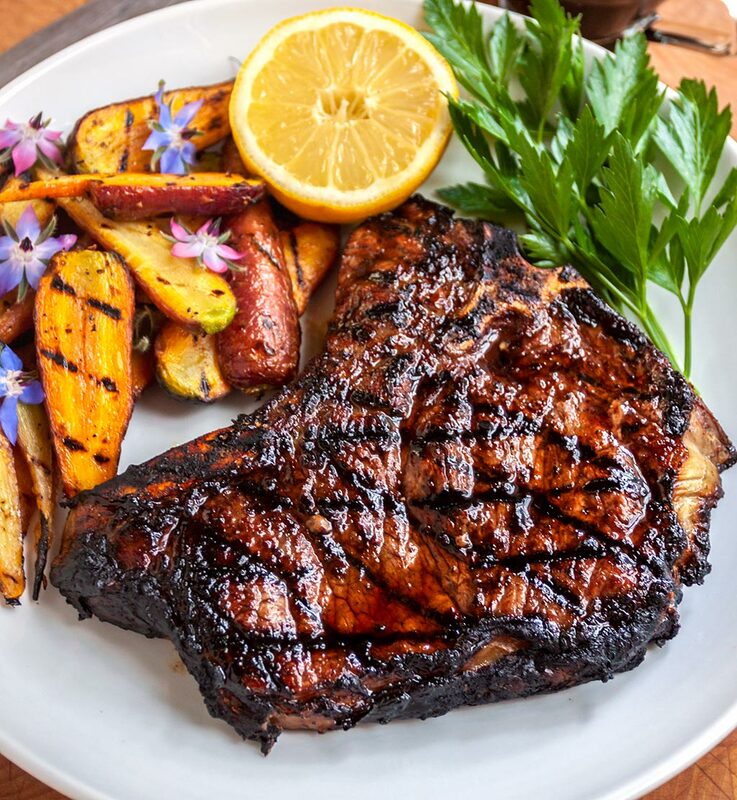 In the classic version of this Florentine dish, a very specific cut of meat known as bistecca nel filetto is traditionally used, but here in the United States, a good quality, thick bone-in steak is a reasonable substitute: a porterhouse, ribeye or t-bone is ideal. Once you have your steaks, the rest of the preparation is simple. Rub the meat with fresh garlic, drench in good olive oil, season generously with salt and pepper and cook quickly over high heat. Our version stays true to the spirit of the original while adding one ingredient that really bumps up the flavor: Earthy Delights Balsamic Glaze. Balsamic glaze (sometimes called Crema di Balsamico or Balsamic Cream) is a thick mixture of balsamic vinegar and grape must, the unfermented juice of the same grapes used to produce balsamic vinegar. The deliciously sweet/sour tang of balsamic glaze enhances the natural flavors of practically any ingredient that it’s paired with, whether sweet or savory. The mixture of mild acidity and natural fruitiness makes it a perfect marinade for meats, adding rich flavor, a gorgeous bronze sheen and attractive dark grill marks. The thick, syrupy texture of balsamic glaze makes it exceptionally easy to work with too. It sticks to meats and vegetables when marinading or basting on the grill. Drizzle it on a plate for a quick decoration and it stays where it’s put. Toss sliced fresh strawberries or other fruit and it coats evenly for an instant dessert. We usually choose a thick bone-in steak like a Porterhouse or T-bone when preparing this dish, but just about any good cut of grilling beef. lamb or game will benefit from this treatment. The set up couldn’t be simpler: just rub with garlic and slather with Earthy Delights Balsamic Glaze, olive oil, salt, and pepper. Grill and serve with cut lemon halves to squeeze liberally over each portion. Bellissimo! Prep the grill, oiling the grate well, and preheat to medium high. Trim excess fat from the steaks. Rub both sides of each steak with garlic, first rubbing the cut side of a garlic clove against the bone to roughly crush it, then spreading it over the meat. Pour the balsamic glaze over the steaks, spreading it to coat both sides evenly. Drizzle the olive oil over the top, again turning to coat both sides. Season the steaks generously with coarse sea salt and black pepper. Set the steaks aside to marinate at room temperature for at least 20 minutes or up to an hour while the grill heats up. Place the steaks on the hottest part of the grill, turning them once, about 4-6 minutes total for the traditional rare steak. Actual cooking time will depend on the thickness of your steaks and your preference for doneness. Allow the steaks to rest for 5 minutes, then serve with a lemon half on each plate. Many of the ingredients used in this recipe, and other recipes on the Earthy Delights Blog, can be purchased online at our retail website, Earthy.com. We welcome you to visit the Earthy.com website to view our extensive selection of wild-foraged and hard-to-find ingredients.